Backlash toward Nike, the world’s largest shoe and apparel company, for using anthem kneeling quarterback Colin Kaepernick in an ad campaign for the 30th anniversary of their “Just Do It” slogan, has been fierce. Nike probably predicted the intense response. It’s doubtful their partnering with Colin happened overnight, as mass amounts of market research were conducted. However, Nike might not have known their stock would crash to the tune of a nearly $4 billion loss. People are literally burning their Nike’s to protest the brand for siding with Colin. One Christian college in Missouri has already severed ties with Nike. Now, the Fraternal Order of Police, consisting of 325,000 members across 2100 chapters, has something to say. “Colin Kaepernick and all Americans have the constitutional right to freely express their views, even if they are uninformed and inflammatory. Indeed, law enforcement officers have an obligation to defend these rights and we do so every day, even in those cases when the views expressed are hostile, hateful or offensive to the men and women of law enforcement. “The Fraternal Order of Police has been called upon to boycott Nike for capitalizing on this former professional football player because he attracts controversy. In our experience, boycotts and similar exercises do not succeed and often serve only to enrich the company—which is not what we want to do. 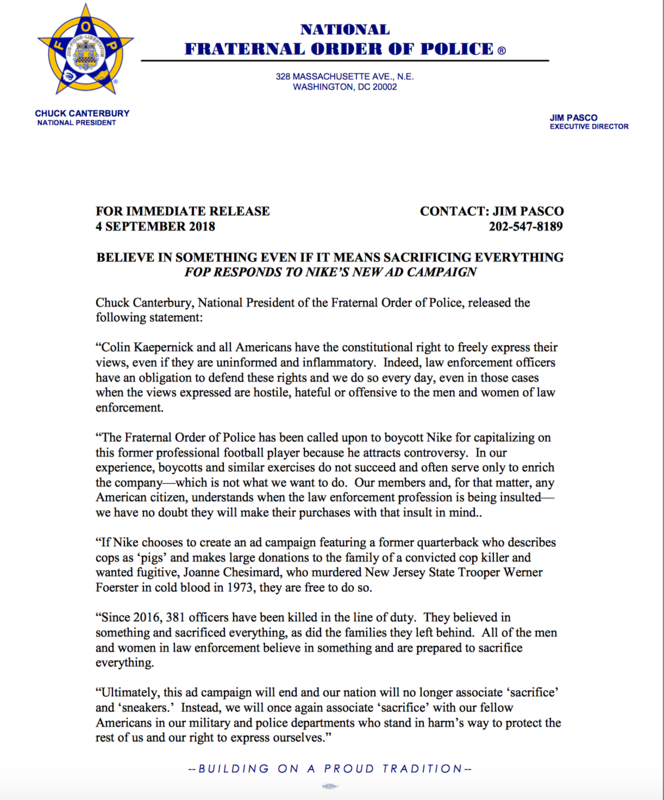 Our members and, for that matter, any American citizen, understands when the law enforcement profession is being insulted— we have no doubt they will make their purchases with that insult in mind..
“If Nike chooses to create an ad campaign featuring a former quarterback who describes cops as ‘pigs’ and makes large donations to the family of a convicted cop killer and wanted fugitive, Joanne Chesimard, who murdered New Jersey State Trooper Werner Foerster in cold blood in 1973, they are free to do so. “Since 2016, 381 officers have been killed in the line of duty. They believed in something and sacrificed everything, as did the families they left behind. All of the men and women in law enforcement believe in something and are prepared to sacrifice everything. It remains to be seen if Nike will continue to utlize Kaepernick down the line. Ultimately, no press is bad press – and right now Nike is getting a ton of press. Nike Inc.’s market capitalization is down $3.4 billion since the company released its latest ad campaign featuring controversial quarterback-turned-activist Colin Kaepernick. But it’s not all bad news. The latest estimates put the value of the media exposure from the campaign at more than $163 million, according to Apex Marketing Group — almost four times the $43 million tallied in the first 24 hours since the ad debuted.